Kacey Musgraves attended the 48th annual CMA Awards held at the Bridgestone Arena on Wednesday (November 5) in Nashville, Tennessee. The singer wore a pink Oscar de la Renta column gown with intricate embroidery creating sparkle and dimension, which she styled with a silver clutch and a huge diamond ring. 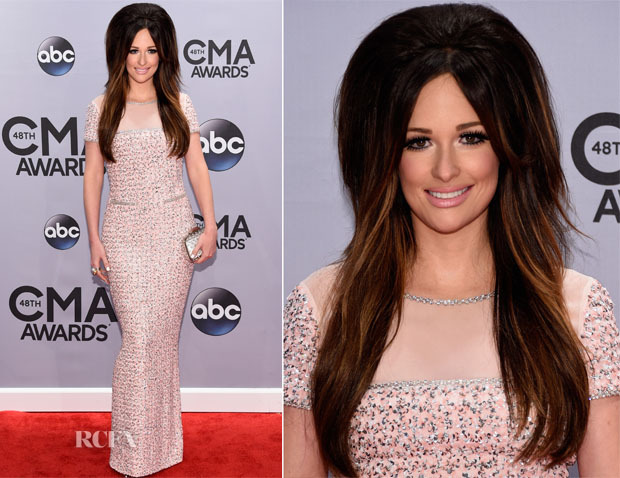 It takes a lot to upstage a pretty pink Oscar de la Renta gown, yet Kacey managed it with her big bouffant. It’s a bouffant Dolly Parton would be very proud of as it’s big and high in true country tradition, however, the end result is a tad comical.